PURCHASE ORDERS: All purchase orders must be received via fax, email or regular mail. All orders will be confirmed via return fax or email within 24 hours. If you do not receive a confirmation promptly, please call your customer service representative. Huffermen will adjust any incorrect pricing on purchase orders received. Special pricing and promo codes must be indicated on the PO to be applied; otherwise, normal catalog pricing is in effect. Order cancellation can take place until the product is printed. Distributor will be billed for all work completed at time of cancellation. SETUP CHARGE: $50.00(G) charge per color applies for all orders and pre-production proofs. The setup charge will be waived for identical reorders of 200 pieces or more, within 2 years of the invoice date of the original or subsequent reorder. Identical reorders of less than 200 pieces will incur a reduced setup charge of $40.00(G). PAPER PROOF: $10.00(G) charge for faxed or emailed proof. Not available on rush orders. Proofs may require 24 hours to prepare. Production time begins once proof is approved. PRE-PRODUCTION PROOF: $35.00(G) charge plus all applicable setup charges. There is no additional setup charge for orders resulting from a pre-production proof provided that there is no change required to the artwork. BLANK PRODUCT: Any product can be ordered un-imprinted. Pricing is next quantity (NQP) and the order will typically ship by the end of the next business day. INK CHANGE: $10.00(G) charge applies for all ink color changes of the same imprint, 50 pieces minimum per color. OVER/UNDER RUNS: All orders are subject to +/- 5% billed pro-rata. $25.00(G) charge applies for orders requiring exact quantities up to 2,500 pieces. For exact quantity charges on larger orders, call your customer service representative. LESS THAN MINIMUMS: $25.00(G) charge applies to printed and blank items. MINIMUM ORDERS: $25.00(G) minimum for all orders. DISTRIBUTOR SELF-PROMOTION: Huffermen will offer all distributor self-promotion orders half-price setup charges and end quantity pricing (EQP). Copy must include the distributor’s name and/or logo. PO must reference “distributor self-promo” to receive special pricing. RUSH PRODUCTION: Please call customer service for rush availability on items without specific rush pricing listed in the catalog. Minimum cost for 24 Hour Rush is $42.50(G), and minimum cost for 3 Day Rush is $32.50(G). Rush pricing listed on each page are for 1 color orders only. Please call customer service for multicolor rush order pricing. ARTWORK: To achieve our printing quality standards, Huffermen requires artwork in vector format saved as an .eps file or .ai Adobe Illustrator file. All fonts must be converted to vector images (i.e. outlines, curves or paths). JPEG and TIFF files can be used provided they are in black and white format, actual size or larger, and have a resolution of at least 300 dpi. One-color artwork must be provided in black and white format. Huffermen can redraw most non-conforming one-color artwork for a $20.00(G) art charge. All artwork should be submitted by email to art@huffermen.com. TYPESET/CLIP ART: Huffermen can add typeset or clip art to your artwork for a $10.00(G) typeset charge. Standard fonts are available, call for details regarding clip art. All typeset charges include a free paper proof. SHIPPING/HANDLING: Freight will be prepaid by Huffermen and shipping charges will be added to your invoice. A nominal shipping and handling charge will be included in all freight charges. Production orders cannot be shipped third party. Consignee is responsible for all claims of loss or damage. Please inspect the condition of boxes upon arrival and report all problems to your carrier. RETURNS/CLAIMS: Huffermen stands behind the quality of our products. Please contact your customer service representative within 30 days if you are unsatisfied for any reason. SAMPLES: Random imprinted samples up to $10.00 are available at no charge with your FedEx or UPS shipper number. 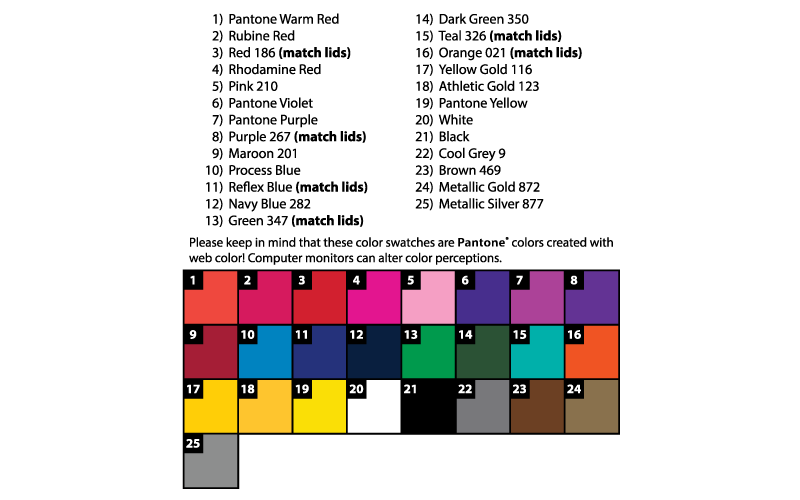 PMS COLOR MATCH CHARGE: $35.00(G) per color charge applies to pre-production proofs, orders, and reorders. PMS matches on dark colored product cannot be guaranteed. PMS colors may vary slightly between original order and reorders, for best matches provide a sample from the original order. Colors may appear darker on dark colored substrates. All handled mugs will be printed Right-Handed, one side, unless otherwise specified.